In synchrotron radiation sources, X-ray diffraction and reflections of the radiation can be used to investigate the structural properties of thin films during the film-forming process. 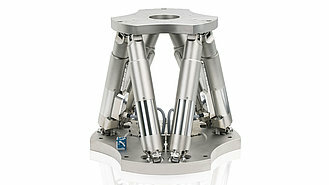 For the high-precision positioning of the samples, parallel-kinematic hexapods provide the best conditions. 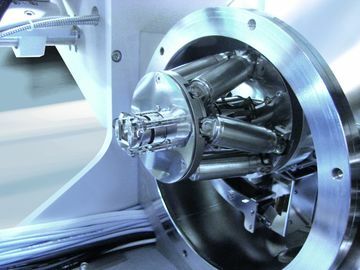 In a compact PLD system (Pulsed Laser Deposition System), a hexapod designed for use in high vacuum positions the sample, relative to the incident X-ray beams. This allows the sample to be tilted by ±5° around the X and Y axes at a resolution of 0.001°. In addition, to compensate for different layer thicknesses, it can be moved in the direction of the Z axis, i.e., vertically to the sample surface, by up to 3 mm. Motions of ±6 mm in the X and Y directions enable scans at different positions of the sample surface. With its diameter of only 130 mm, the compact hexapod has a height of only 115 mm.